Takayama Festival, or Takayama Matsuri, is a major event held each spring and fall in Takayama, Gifu Prefecture. With a parade of gorgeous floats and people wearing traditional samurai clothes, the festival will take you back in time through history. Takayama Festival (Takayama Matsuri) is a festival held in spring and fall in Takayama City, Gifu, a prefecture in the Tokai Region. The spring Takayama Festival (held every April 14 and 15) is an annual festival of Hie Shrine in Takayama City. It is celebrated with 12 extravagantly decorated yatai (*1) that are carried around the city. Hie Shrine is also called Sanno-san, so this festival is known as the Spring Sanno Festival, as well. The fall Takayama Festival (every year on October 9 and 10) is an annual festival of Sakurayama Hachimangu. It is also known as the Hachiman Festival. During this festival, 11 floats are paraded through the city. Both festivals boast glorious floats. Festival-goers can also see participants wearing kamishimo (*2), or samurai costume, in the parades. During the festival period, the whole town slips back into time to the Edo Period. It is said that every year 200,000 people visit each festival to admire the grandiose scenery of magnificent floats and people parading through the city. Takayama Festival is one of three great hikiyama festivals in Japan. Hikiyama festivals are festivals celebrated using the floats. Other famous festivals included are Gion Festival in Kyoto, and Chichibu Night Festival in Saitama. Continue reading to find out the schedule and how to get to this festival in 2019. *1 Yatai, float: a large usually vessel carried (on shoulders) or dragged around by men during a festival in Japan. It is also called hikiyama, dashi, or danjiri. Yatai-hikimawashi refers to the parade during which men carry or push the float through the city. *2 Kamishimo: the formal traditional wear for men in Japan. Both Takayama Festivals, the one held in spring on April 14 and 15, and the one held on October 9 and 10, occur annually on the same dates. You can check the days of the festival for 2019 down below. The floats used in the spring festival are deemed Important Tangible Folk Cultural Property in Japan, so please note that the whole festival will be canceled in case of rain. The best route to get to the two main venues of the Takayama Festival, Hie Shrine, and Sakurayama Hachimangu is via Takayama Station, the nearest station. As the festival parade moves around the city, you can see it from different spots. Use the Tokaido Sanyo Shinkansen to get from Tokyo Station to Nagoya Station first. Get off at Nagoya Station and ride the JR (Limited Express Wideview) Hida bound for Toyama. Get off at Takayama Station. It will take about 4 hours and 20 minutes in total to reach Takayama from Tokyo, and the ticket for a reserved seat costs 14,620 yen. It takes around 25 minutes walking to get to Hie Shrine from Takayama Station. On both April 14 and 15, you can see the yatai-hikisoroe, a display of 12 floats lining up while being carried around the city. It takes about 20 minutes on foot to reach the main venue of the fall festival, Sakurayama Hachimangu, from Takayama Station. 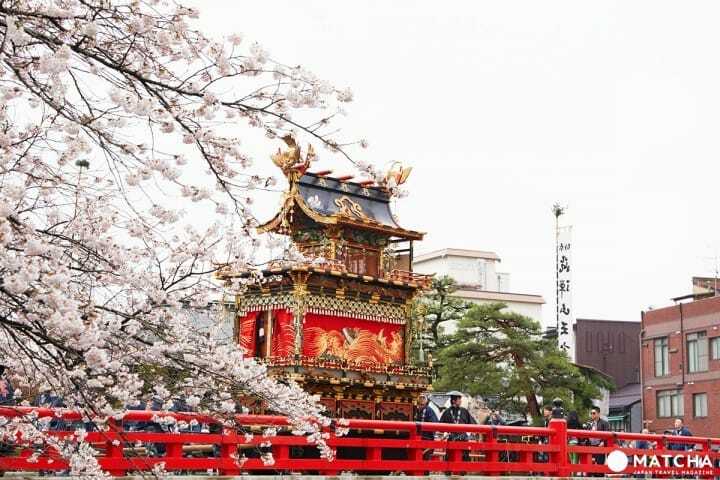 Both October 9 and 10 are full of events, such as karakuri display, a puppet show, and the yatai-hikisoroe, the parade with a grand procession of 11 floats going to the shrine. During the parade and the goshinko, the transfer of the portable shrine, which is part of both festivals, as many as a few hundred people gather to take part. In the parade, apart from the mikoshi and shishimai (*3; lion dance), you can also see the tokeiraku, a group wearing kimono characteristic of the Hida Region, as well as a samurai group wearing traditional garments. You can see the parade on every day of both festivals, April 14 and 15, and October 9 and 10. *3 Shishimai: the dance of a mythological creature based on a lion. Usually, the dancers wear a wooden mask, shishigashira, which resembles a lion’s head. Out of the 23 floats that appear during spring and fall festivals, one features clockwork-style karakuri dolls (puppets). This float holds a special puppet show at two locations during the spring festival near the Takayama Festival Information Center. During the fall festival, it is performed inside the Sakurayama Hachimangu grounds. You can watch the puppet shows on any day of the festivals: April 14 and 15, or October 9 and 10. Takayama Festival also has yomatsuri and yoimatsuri, two events that start after the sunset. The event is called yomatsuri in spring and yoimatsuri in fall. Different than the lavishly decorated floats you can watch during the day, the night version of this float seems to have come straight out of a fairytale. During the spring festival, this event is held on April 14, starting from 18:30. For the fall festival, you can admire it on October 9, from 18:00 to around 21:00. This valuable tradition, Takayama Festival, is held twice a year, in spring and fall, with each festival lasting for two days. The festival schedule is easy to adjust to your personal travel itinerary. Take part in the festival for one day only, or enjoy it from the beginning to the end. *All information on the transit time and fee was taken from the official website and is current as of April 2019. Please mind that the information is subject to change. *This is a rewritten version of an article published on April 2, 2017. All Eyes On The Chichibu Night Festival - What Makes It So Special?